Alba Mons is the largest volcano, by area, on Mars. A low-lying volcano in the northern Tharsis region, Alba Mons has an elevation of 6.8 km, and volcanic flow fields that extend at least 1,350 km from the summit. Alba Mons is one of several areas on Mars that may contain thick deposits of near-surface ice preserved from when the planet’s climate could have allowed mountain glaciers to exist at the mid-latitudes (1 to 10 million years ago). 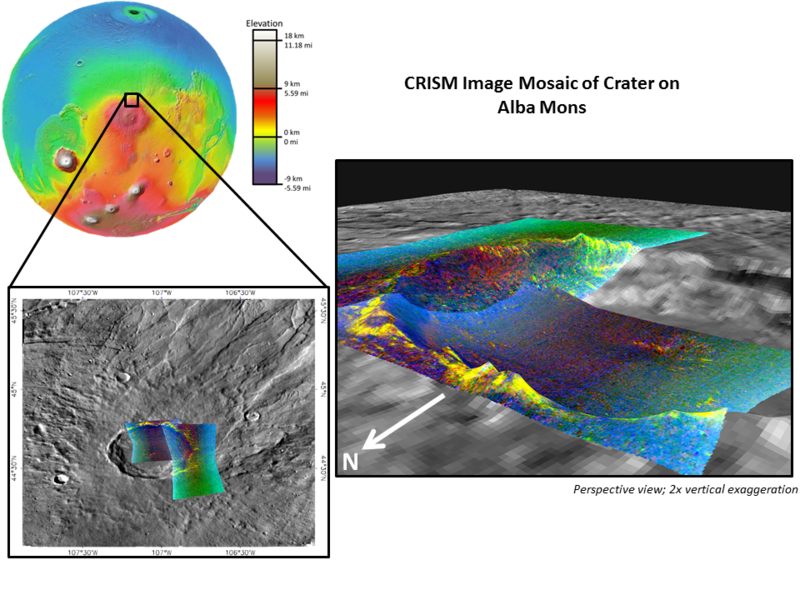 Data collected by the Neutron Spectrometer on Mars Odyssey indicates that the northern flank of Alba Mons might contain up to 7.6% of water-equivalent hydrogen, suggesting the possible presence of water ice today. Since water is not stable on the surface, however, the water would need to be frozen and blanketed by at least 1 m of dust or other material to prevent sublimation and loss to the atmosphere. Such a thick dust layer also makes direct detection of the predicted ice difficult. Despite all of this, however, in early spring when the northern ice cap is still receding, water ice frost can persist a little longer on the surface in shadowed areas of craters and other topographic features. This CRISM mosaic of two images covers a 22 km diameter crater on Alba Mons’ northern flank and highlights the presence of water frost (yellow) on the northward-facing slopes of the crater rim. Mosaic is of FRT 92E0 (acquired January 4, 2008) and HRL 98C3 (acquired January 20, 2008).